With the Zapier Integration, you can connect your SproutVideo account to thousands of other platforms and apps like Gmail, Slack, and Dropbox. 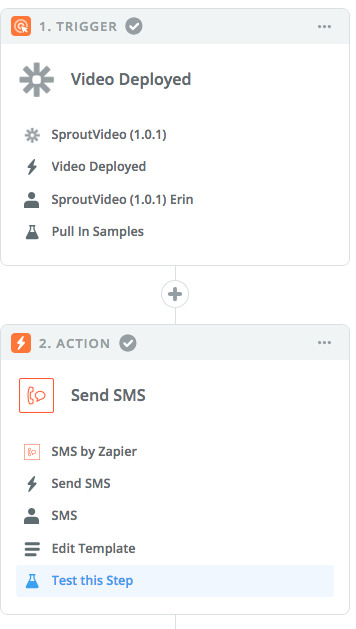 With Zapier, you can set up an automated workflow between your SproutVideo account and other apps you use. These automated workflows are called Zaps. A Zap is started with a trigger and completed with an action. In the example below, the trigger is a new video being deployed, and the action is a text message alert being sent acknowledging that the video was successfully deployed. There are countless other ways to use Zapier and SproutVideo together. If you have specific questions about the options available or how to set up your Zap, we’d love to help.